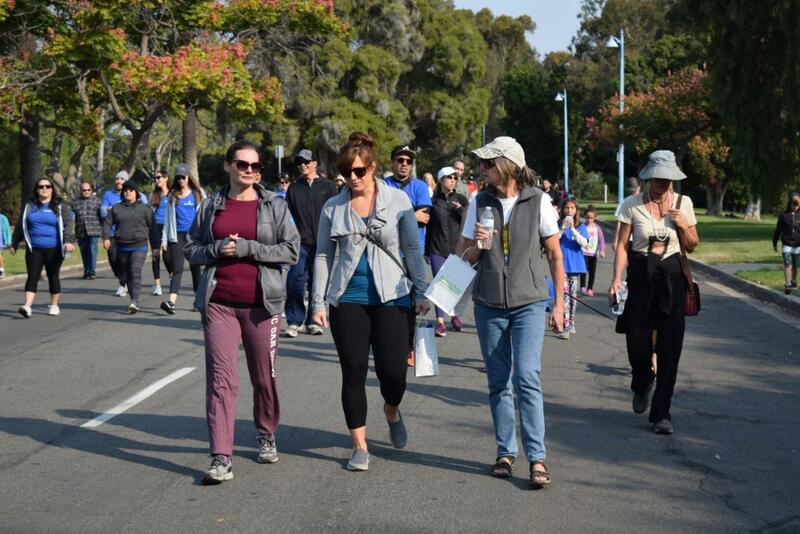 Human Geography teacher Laura Lowery attends the suicide walk at Balboa Park on Nov. 11th. She participated in the walk with her friends in remembrance of a lost loved one. People scattered all over Balboa Park rushed towards a stage, bowing their heads as a way to pay their respects to suicide victims. The American Flag waved high above the crowd as people joined together hand in hand. They raised their hands up high and lifted their heads to catch the sight of a flock of doves being released into the sky. One elementary-aged boy held up a sign that read, ‘The pain doesn’t go away, you just make room for it’. This movement based around local suicides was known as the Suicide Prevention Walk. It took the community by storm on Sunday, Nov. 11 and nearly filled the entirety of 6th Ave & Laurel Street in Balboa Park. Some of Bonita Vista High School’s own students and teachers made an appearance at the event. They choose to comfort those around them in grief and to lend a helping hand in the event by holding up signs throughout the walk with a number of encouraging messages. Joining our student volunteers in the action was BVH Human Geography teacher Laura Lowery, who walked alongside the hundreds of San Diegans banded together for the same cause. Lowery explained that this issue was personal to her because her boyfriend committed suicide three years ago. Ever since then, she has been attending events like this march in support of the cause. “It’s always a shock at first, but looking back you start to realize that some people that you’re really close to may be struggling and you don’t realize it. I want to encourage people to be vulnerable and actually talk to people about what they’re dealing with personally so that they’re not so alone. I wish he had felt comfortable enough to open up to me about what he was struggling with,” Lowery said. As for the occasion itself, there were several programs within the walk that took place. There was a remembrance tent where families could create or even bring their own posters with photos of loved ones they have lost, decorated with glitter and stickers. Children and adults alike also got to paint rocks and display them around the walk. Madden began her work at SOSL 14 years ago after losing her brother to suicide. Since then, she has dedicated her life to helping those in need and who have experienced the same pain of losing a loved one. Since then, Madden has lead three other fundraiser events for SOSL, all of which have been located in San Diego. “I’ve only had a few students from Bonita Vista sign up, but I’m excited. I love that students come out and volunteer,” Madden said. BVH students were sent an email with an application to volunteer at the event on Nov. 1. In response to the email, students such as Aleman spent their Sunday weekend at Balboa Park, helping to set up the activities and organizing the walk with several of the other event directors. “We have students participating and taking on some leadership roles and I’m very proud of them I think it’s a very important cause. It’s an important message to build awareness around. I am definitely supportive of it,” BVH Principal Roman Del Rosario, Ed.D said. Del Rosario mentioned that a Suicide Prevention-themed grant will make its way to BVH in February. This same program that was implemented this semester at Eastlake High School. This program is making its way to our school through a new found partnership with the organization South Bay Community Service. According to Del Rosario, trained professionals will be giving presentations to students to inform them about suicide prevention. The professionals will also survey students and then council those who display risk factors which could indicate a life in danger. The peer counseling team will also receive additional training in February. “They’ll pull you out of a different class on another day and just make sure everything is okay, and possibly if you need someone to talk to, they’ll connect you with those services,” Del Rosario said. From the Suicide Prevention Walk, to the grant coming in February, the San Diego embraces a movement of suicide prevention.